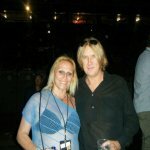 Def Leppard singer Joe Elliott attended the recent Bon Jovi show in Madrid, Spain. Bon Jovi played a show at the 54,000 capacity Vicente Calderon Stadium in Madrid on 27th June the day after Lep played in the same city. Joe was pictured backstage with a local fan who posted the photo on twitter. The show was the only Spanish date on Bon Jovi's current Because We Can world tour with 26 song setlist played. Joe performed with Jon at his solo show in Las Vegas on 25th March.